Was Abraham Lincoln related to General Robert E. Lee? For over 80 years, a debate has raged over a claim by Lincoln scholar Rev. William E. Barton that President Abraham Lincoln and General Robert E. Lee were related through a common ancestor of Col. Richard Lee. DNA evidence has finally put this question to rest. In January 1929 over a million Americans opened up their copy of Good Housekeeping magazine and found an article by the Rev. William E. Barton titled “Abraham Lincoln was a Lee.” The article referred to Barton as “the foremost living authority on Lincoln,” which at the time was probably true. In the article, Barton claimed that President Abraham Lincoln and General Robert E. Lee were cousins through their common ancestor of Col. Richard Lee. Barton continued this claim later that same year in his book The Lineage of Lincoln, devoting an entire chapter to the claim. The Rev. Barton's Good Housekeeping article was an attempt to show that President Abraham Lincoln was a descendant of Col. Richard Lee and his wife Anne Constable through Lincoln’s ancestors of William and Dorothy (Taylor?) Lee. Barton claimed that William Lee was the grandson of Col. Richard Lee through an unknown son of the Colonel. Barton included a pedigree showing the descent of President Lincoln and General Lee from Col. Richard Lee. In the line containing Lincoln, he identified the son of Col. Richard Lee with a question mark. So is the claim true? 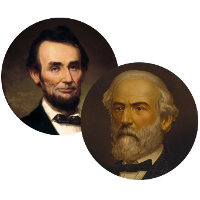 Were Lincoln and Lee cousins through Col. Richard Lee? Since Barton’s claim in 1929, a number of historians and researchers have repeated Barton’s claim as though it were fact. Some even go further than Barton by naming the alleged son who was the father of William Lee. Over a half century later, Lincoln scholar and researcher Paul H. Verduin stated that “William Lee was no relation to the aristocratic Lees of Stratford Hall, or any of the other prominent Lee families of Virginia.” Verduin is often cited as having compiled the most complete pedigree for Lincoln’s Hanks ancestors. Col. Richard Lee, “the immigrant,” was christened in St. Martin parish, Worcester, England, the son of John Lee (also Lies/Lyes) and Jane Hancock, daughter of Edward Hancock and Alice Jeffrys of Twining, Gloucestershire, England. He is said to have arrived in Jamestown, Virginia in 1639 and settled in York County, Virginia. Shortly after his arrival he married Anne Constable, a ward of the first colonial governor of Virginia, Sir Francis Wyatt. Richard and Anne Lee are known to have had eight children, six sons and two daughters. Gen. Robert E. Lee descends from their son Richard Lee and his wife Laetitia Corbin. In 1895, Edmund Jennings Lee published the book Lee of Virginia, 1642-1892. It is considered by many as the best genealogical source for the descendants of Col. Richard Lee. The book has been reprinted several times and editions since 1983 have included an Additions and Corrections section provided by The Society of the Lees of Virginia. The Society was organized in 1921 and is open to any person who can provide sufficient documentation to prove a descent from Col. Richard Lee and Anne Constable by connecting to a descendant in the most current edition of the book. Gen. Robert E. Lee’s descent from Col. Richard Lee and Anne Constable can be found in Edmund Jennings Lee’s book. General Lee is the son of Revolutionary War General Henry “Light Horse Harry” Lee III. Henry Lee III was also the 9th Governor of Virginia. He was the son of Col. Henry Lee, and the grandson of Henry Lee and Mary Bland. Henry Lee, the first, was the son of Richard Lee and Laetitia Corbin, and the grandson of Col. Richard Lee, the immigrant. Clinton Lee is the former Project Coordinator for The Lee DNA Genealogy Project of Virginia. The purpose of the project was to collect Y-DNA results from Lee males with an unbroken patrilineal line back to their earliest proven Lee ancestor. Out of hundreds of Y-DNA tests submitted to the project while Clinton Lee was project coordinator, only three successfully connected to the family of Col. Richard Lee. Thanks to the help of Clinton Lee, the Y-DNA results for two of the descendants of Col. Richard Lee can be used to verify whether or not Barton’s claim is true. Both of the descendants stated they were members of The Society of the Lees of Virginia. Their documented descent from Col. Richard Lee, therefore, was accepted by The Society. The first DNA donor is a patrilinial descendant of Hancock Lee, son of Col. Richard Lee. The second DNA donor is a patrilinial descendant of Charles Carter Lee, brother to Gen. Robert E. Lee and descendant of Richard Lee, son of Col. Richard Lee. Both descendants took a 43-marker Y-DNA test from Relative Genetics (now Ancestry). Their resulting haplotypes were a match with 42 of 43 markers an exact match and a haplogroup of I1a. For Barton’s claim to be true, Y-DNA tests for patrilineal descendants of Lincoln’s ancestor William Lee, husband of Dorothy, should result in a match with those of Col. Richard Lee’s patrilineal descendants. For over a century, the parentage of Abraham Lincoln’s mother Nancy Hanks had been somewhat of a mystery that only recently was resolved through DNA evidence. But even prior to its resolution, the one thing most historians and researchers seemed to agree on was that Nancy Hanks was the granddaughter of Joseph and Ann “Nanny” (Lee) Hanks. This fact was confirmed by Abraham Lincoln himself in his June 1860 autobiographical notes where he mentions his mother’s first cousin John Hanks. John was the grandson of Joseph and Ann (Lee) Hanks through their son William Hanks and his wife Elizabeth Hall. The documentary evidence supports Abraham Lincoln being the 3rd great-grandson of William and Dorothy (Taylor?) Lee, but this is where the evidence ends. There has been no evidence to date that links William Lee to a son of Col. Richard Lee. Rev. Barton admitted this fact in his Good Housekeeping article when he stated, "Unfortunately we do not know, and there is apparently no way of finding out, the name of the father of that William Lee." In 2011, an article appeared in the National Genealogical Society Quarterly that opened the door to finally resolving this issue. Written by Judy Kellar Fox, the article was titled “Documents and DNA Identify a Little-Known Lee Family in Virginia” and presented Y-DNA evidence for three lines of descent from William and Dorothy (Taylor?) Lee through their sons William and Charles. 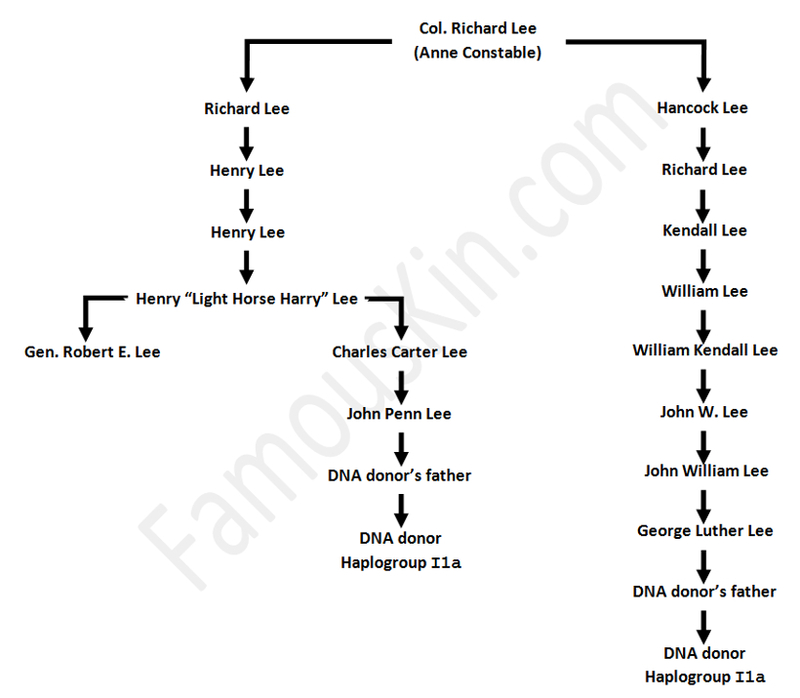 Since President Lincoln’s 2nd great-grandfather William Lee, father of Ann “Nanny” Lee, was a documented son of William and Dorothy, the Y-DNA results presented in Fox’s article could also be used to compare with those from Col. Richard Lee’s documented patrilineal descendants to verify whether or not Barton’s claim is true. Two of the descents in Judy Fox’s article were for patrilineal descendants of Charles Lee. The descendants both took a 37-marker Y-DNA test from Family Tree DNA. Their results were identical. Their tests also revealed a surprise possible match to a patrilineal descendant of William Lee, son of William and Dorothy Lee. However, this third person’s test was through a different company, a 46-marker Y-DNA test from Relative Genetics (now Ancestry). To verify this third match, one of the descendants of Charles Lee took the same 46-marker test from Relative Genetics. The results were another perfect match. They all share a single haplotype. These tests revealed that the DNA donors had a 95% chance of a common ancestor within seven generations. Combined with documentary evidence, Judy Fox was able to show that the DNA donors were all descendants of brothers William and Charles Lee, who were sons of William and Dorothy Lee. The haplogroup they belong to is R1b. Through his great-grandmother Ann “Nanny” Lee, Abraham Lincoln was a Lee, but not through the Lee family that the Rev. Barton claimed. 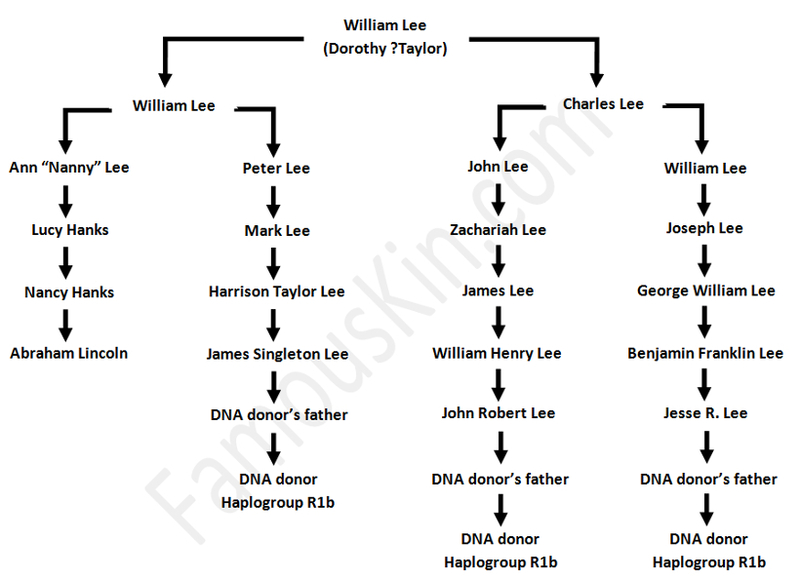 If Lincoln and Lee were related as Barton says, then the haplotypes of the DNA donors for both Lee families should have been genetic matches. Not only did the haplotypes not match, but the more general haplogroups also did not match. Lincoln’s Lee family is haplogroup R1b, while Gen. Lee’s family is I1a. The fact that the two Lee families belong to different haplogroups would indicate that any common ancestor along their patrilineal lines would, at a minimum, have been thousands of years ago, well before recorded history began. Documentary evidence combined with DNA evidence has proven that President Abraham Lincoln and General Robert E. Lee are not related to each other through Col. Richard Lee. Where documentary evidence is lacking, DNA evidence can often fill in the gaps and bring the truth to light. I am very grateful for the help I received from both Clinton Lee and Nancy Royce without whose help this article would not have been possible. I am also grateful to the DNA donors who allowed me to share their Y-DNA test results so that mysteries such as these can be solved. I am also grateful to Judy Kellar Fox whose article in the NGS Quarterly set the lightbulb off in my head that this issue could finally be resolved. N. W. Ayers and Sons Directory of Newspapers and Periodicals,1930, Philadelphia: N. W. Ayers and Son (1930). Good Housekeeping circulation for 1930 is listed as 1,741,640. William E. Barton, “Abraham Lincoln was a Lee,” Good Housekeeping, Vol. 88 (January 1929): 20-21, 194, 196, 199. William E. Barton, The Lineage of Lincoln, Indianapolis: The Bobbs-Merrill Company (1929), 196-211. Barton, “Abraham Lincoln was a Lee,” 20. Mary Taylor Brewer, From Log Cabins to the White House - - A History of the Taylor Family, Wooton, KY: M.T. Brewer (1985), 275-276. Clara McLaughlin Funai, A Weaving, Lynchburg, Virginia: The J. P. Bell Company (1977), 22. Lyon Gardiner Tyler, Barton and the Lineage of Lincoln: Claim that Lincoln was related to Lee refuted, 2nd ed. Holdcraft, VA: n.p. (1930), 7-8. Paul H. Verduin, “New Evidence Suggests Lincoln's Mother Born in Richmond County, Virginia,” Northern Neck of Virginia Historical Magazine, vol. 38 (December 1988): 4355. Christopher Challender Child, “The Maternal Ancestry of Abraham Lincoln: The Origins of Nancy (Hanks) Lincoln, A Study in Appalachian Genealogy,” New England Ancestors, vol. 4 (Winter 2003): 55 [note 13]. Christopher C. Child, “The Hanks DNA Study, I Was Wrong!” American Ancestors, vol. 17 (Fall 2016): 56. William Thorndale, “The Parents of Colonel Richard Lee of Virginia,” National Genealogical Society Quarterly, vol. 76 (December 1988): 253-267. “The Lees of Virginia,” The Society of the Lees of Virginia, (accessed 30 Jan 2014). Edmund Jennings Lee, Lee of Virginia, 1642-1892: Biographical and Genealogical Sketches of the Descendants of Colonel Richard Lee, Baltimore: Genealogical Publishing Co. (1983). Y-DNA tests, also referred to as Y-chromosome tests, look at the male inherited Y-chromosome. Since it can only be passed on from father to son, it can be used to trace a direct paternal line. Mike Gruss, “You're related to Robert E. Lee? What a coincidence . . .,” The Virginian-Pilot, published 28 MAR 2009, accessed 29 MAR 2017. A haplotype is the set of results for each marker in the Y-DNA test. A haplogroup is a group of similar haplotypes that share a common ancestor defined by a one-time change in your DNA code at a specific point. This is also referred to as a single nucleotide polymorphism (SNP) mutation. The test results for Col. Richard Lee’s descendants showed a one-step mutation on the 43rd marker, DYS635, with a value of 24 versus 25. Suzanne W. Hallstrom, et. al., “Nancy Hanks Lincoln mtDNA Study ~ Unlocking the Secrets of Abraham Lincoln's Maternal Ancestry,” Hanks DNA Project, published 21 OCT 2015, accessed 22 OCT 2015. Abraham Lincoln, Autobiographical notes possibly written for John L. Scripps, June 1860, Holograph manuscript, Robert Todd Lincoln Papers, Manuscript Division, Library of Congress, p. 8. “He is the same John Hanks who now engineers the ‘rail enterprize’ at Decatur; and is a first cousin to A's mother.” In his notes, Lincoln refers to himself in the third person as A.
 Douglas L. Wilson and Rodney O. Davis, Herndon’s Informants: Letters, Interviews, and Statements about Abraham Lincoln, Urbana and Chicago: University of Illinois Press (1998), 779. “North Farnham Parish Christening Index 1663-1814,” Batch C505381, FamilySearch, accessed 16 Oct 2013, William Lee. Richmond Co., Will Book 5: 531-32, Elizabeth Taylor, dated 11 May and proved 07 September 1747; FHL microfilm 33,677, item 3. Richmond Co., Account Book 1:547, William Lee, dated 03 April 1769; FHL microfilm 33,679. William E. Barton, “Abraham Lincoln was a Lee,” 196.